Remember Xtranormal? The site that said "If you can type, you can make movies." Although its online studio was very limited it was still pretty good for making short, dialogue driven videos with visually interesting 3D characters and backgrounds. Here's a reminder with one of my best Xtranormal videos using some of their Star Trek based characters. I enjoyed Xtranormal quite a bit but its pay as you publish business model and the need to purchase themes made it expensive. Particularly if you graduated to the downloadable desktop version, State, which gave you more functionality, increased possibilities and an even lighter bank account. Last year, around mid 2013, Xtranormal closed down its website with a promise to rethink its business model and maybe make a come back. As it turns out Xtranormal is no more. Its intellectual properties were liquidated and, early this year, sold to a new company called Nawmal. Presently Nawmal is still in the process of assessing how best to move forward with their purchase. Somewhere in the interim of Xtranormal's demise State Plus was born. An application that turns Xtranormal's State into an independent piece of software and includes the majority of Xtranormal's themes and other content entirely for free. It even allows you to mix themes and has features added or unlocked that weren't part of the original application. You can see many example videos of what State Plus can do on the Emergent Animation YouTube Channel. The State Plus promotional video below shows a selection of characters from different themes all in the one scene. State Plus allows you to run the Xtranomal desktop application, State, with no need for a user account or even an internet connection. It is the result of much hardwork by dedicated Xtranormal user, Glenn Saunders, who has been closely involved with the liquidation and sale of the software. Glenn's motivation is the hope that State Plus would one day be released in an official capacity as a serious animation tool that is relatively easy to learn. 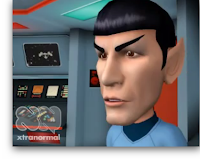 It has the potential to create dialogue driven movies of all types and, in my opinion, the animation of Xtranormal's characters was the most natural and second to none with the site's peers. Presently, with the sale of Xtranormal's Intellectual Property, how long State Plus can be distributed for free is uncertain. If you're prepared to weather an extremely large download (anywhere between 9-16 Gigabytes depending on how you download it) and possibly struggle with getting the software running correctly it's probably worth pushing through to experience everything and more that Xtranormal's software was capable of. If you do run into trouble installing State Plus then the support forum is active and you should be able to find help. "Hello everyone. Some of you recall that early in the year I began working with Xtranormal's liquidator. This amounted to a temporary amnesty for State Plus, and in exchange, I restored, reorganized, and assessed their file archives. This greatly helped facilitate the sale." "I always felt that if Xtranormal were to be sold, that the best home for it would be back with one of the founders. I'm therefore happy to announce that Paul Nightingale, Xtranormal's original Vice President, is the new owner of Xtranormal's intellectual property." "When Xtranormal shut down, State Plus held the proverbial torch. Up until now, if anyone wanted to find out what happened to Xtranormal, they'd eventually wind up here, where they could get back up and running again. But I knew if it were sold that the torch would need to be passed back to the new owner, and that time is now." "I began my journey of State Plus because I had a vision for where this kind of animation software should go. And I took it as far towards that ideal as was possible, considering that I was limited to manipulating it only from the outside. In talking with Paul it is clear that our vision of the ideal tool is the same. And just as Xtranormal's IP has gone back to where it started, it's now necessary for State Plus to join it. I am transferring ownership of State Plus itself to Paul. By doing this, State Plus should now be classified as an extension of Xtranormal's IP [Intellectual Property]." "State Plus is now collaborating with Nawmal, the new owner of xtranormal's technology. For information and to be kept informed of any upcoming releases sign up to the newsletter at www.nawmal.com"
Looks like the shoe/axe dropped - State Plus cannot be downloaded any more nor does it's web site show anything of interest or use. If you know any *other* alternatives, many people (like me) would be interested. If you like script based animation in 3D then Plotagon is probably the next best thing to Xtranormal/State Plus for now... until State's new owner re-releases the software. The new owners did not acquire the IP just to sit on it. We were handing it out like candy for 8 months and the new owners are at least gracious enough to bless those who got it, but they can't keep handing these freebies out endlessly. Plus, State is 5+ years old and the engine inside of it even older. That other software out there still hasn't exceeded its potential in all areas is kind of sad, but the only way to move forward is through real R&D which requires commercial interests. Be thankful that XN's IP isn't in limbo anymore and stay tuned. As for Plotagon, I was more than willing to give them the benefit of the doubt, but their current pricing model is a loser and they haven't reached critical mass. The deck is stacked against them and I'd be surprised if they really truly improve their engine enough to make it a contender. 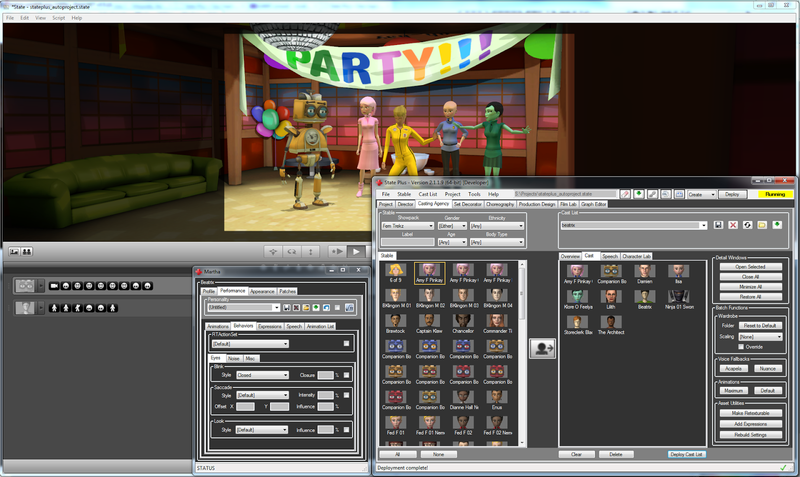 I only recommend Plotagon in that it's similar to what Xtranormal used to be in terms of its online studio. GoAnimate also has a similar part of its website where you can simply type dialogue and the animation will be automatically created. Neither are as good as what Xtranormal had going. However Xtranormal is largely a forgotten site. With State Plus no longer available and no time frame for when it may appear again people can only look for alternatives. BTW, the reason the long press release which was quoted above as members-only is I wanted to avoid those who got shut out from feeling bitter about there being haves and have-nots. But like I said, the door was wide open for 8 months and you'd think those who missed Xtranormal the most went looking for it and found us (really only a hop and skip away from Wikipedia and elsewhere). Latecomers just need to wait and see what happens. I really don't think anyone's going to be feeling bitter about missing out on State Plus. Particularly if they know the reason why State Plus is no longer available. As demonstrated by the first comment to this article what's likely to cause issue is a lack of information, which allows people to make unfounded assumptions (also demonstrated above in the same comment). Which is why I decided to post an update by quoting from the forum. I could've probably recounted the same thing in my own words but then it sounds more like rumor. While it's still early days, Nawmal's website does nothing to inspire hope or confidence. Not even a proper sign up box to a newsletter to keep people informed, or any kind of pitch to encourage investor interest. At the very least Nawmal needs to start updating its News page so people, who would like to see State Plus, return can see it's not a dead platform. It's now been another 8 months since your last reply and no sign of positive movement in Nawmal's side besides them shooting down my proposal to sell a rerelease State with a compilation pack of assets. Just one hearsay rumor from a child who claims to have had direct email communication with them in which something was promised to be released in "early 2015". Take of that what you will. Honestly, I doubt too many people are hanging out to see the new 'Nawmal'. Certainly not enough to build a business around. However, the longer nothing happens the more likely Nawmal will end up with little more than a white elephant for its money. Nawmal has replaced xtranormal, but the price is very high, $9 to $99 per month (for more features); I can't justify this for my business; but would do it if I could pay one time. The subscription model doesn't work all the time; don't like this at all. I agree that Nawmal's pricing is too high. I would prefer the software to be a one time purchase and then you can buy just the themes you want... Or if you want everything then keep the option of annual or monthly subscription. I miss Xtranormal terribly even in 2018. Nawmal still shows its very expensive pricing structure from 2015 so I guess it's time to close the door. My "Pete and Barb" Xtranormal videos made in 2009 still live on YouTube, but my hopes for an Xtranormal comeback of any sort have long been extinguished. Damn. I haven't revisited Xtranormal because their pricing is prohibitive for the casual user. Their business model seems entirely focused on professional users. I recommend Muvizu as a great alternative. The full license version is very affordable for casual users plus it gives you access to 3D characters in many styles, not just the standard Muvizu style.